Jacob Haish's portrait can be seen in the DeKalb Masonic Temple, greeting those who pass through the lobby. It has been with the organization since the Haish mansion was awaiting its demolition. In the years since, curious locals, bus tours, and historians have made the visit to the Masonic Lodge on Fairview Drive to get a glimpse of the large portrait. Local lore, and members of the Masonic Lodge, recall it being saved by members of the lodge shortly before the house's demolition because of Haish's involvement with the fraternity. After all, the organization was such a large part of his life that a Masonic emblem is emblazoned on his monument in Fairview Cemetery. His monument also features three steps up to the urn, and the three steps represent the three steps in Masonry, according to a Dec. 11, 1928, Daily Chronicle article. Haish, or "Brother Jacob" as he'd be known by fellow members, was a member of DeKalb Lodge #144 for 59 years, said current secretary Richard Spahn. Their records show he was the first and only Haish to be a member of the DeKalb Lodge, a group of men who meet the fraternity's prerequisites: a male who lives a good moral and social life, and who also believes in a Supreme Being. Spahn said during Haish's time, the Lodge was also a great way to "rub elbows" with other members of the growing community. To this day, the organization regularly hosts and participates in charitable projects, including Illinois child identification programs and local fundraisers. "It's a way for men to gather, improve themselves morally," Spahn said. "You meet and make friendships." The portrait of Haish is a reminder of the organization's earlier days, Spahn said. Local historian Steve Bigolin's book "Landmarks of the Barb City" describes the portrait as it was in the Haish mansion, through the recollections of Haish's neighbor Beatrice Gurler. "According to Gurler, when one would enter through the front door, a large, lifelike portrait of Mr. Haish stared one in the face. She told me that even she found it necessary now and then to do a double take, so to speak, when Haish opened the door himself, to be sure which was which," Bigolin wrote. 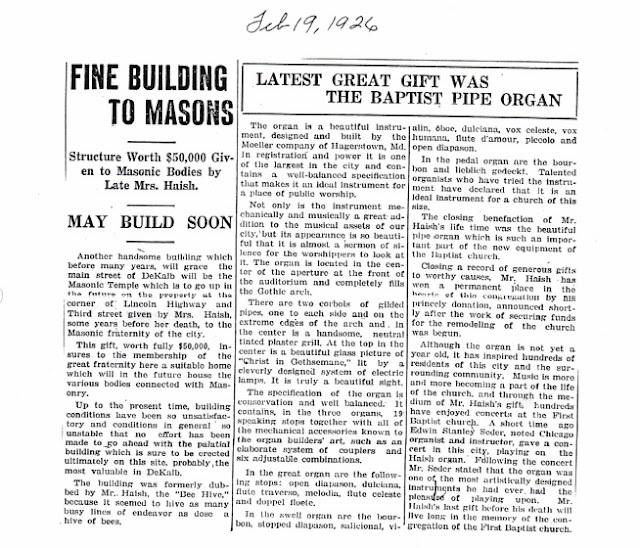 As Haish was known for many philanthropic and charitable givings, he also donated to the Masonic Lodge. Newspaper articles state that he donated an entire building for the organization's use. (See newspaper article above.) Once the group outgrew that building, they moved to another on Locust Street before finally settling in their current building on Fairview Drive. Haish Stone "Is Splendid One"